With HIPPO Multipower products, a single vehicle can be dispatched to a jobsite that is equipped to deliver four types of power. With HIPPO Multipower products, a single vehicle can be dispatched to a jobsite that is equipped to deliver four types of power – hydraulic, air, electric and welding. Use them for road surfacing projects, sewer maintenance, sidewalk repairs or other municipal tasks. The Multipower units eliminate the need for numerous trucks on a single jobsite or the need for several engine-driven units on a single truck. The systems provide hydraulic, air, electric and welding power all from a single unit powered by the truck’s PTO or a single dedicated diesel engine. 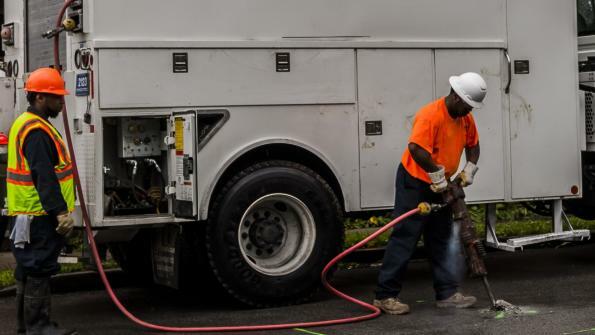 The company’s truck-mounted units are designed to provide all the power needed on any jobsite. The firm’s systems are available in either the P-Model or the E-Model. They offer mobility, increase productivity and help reduce or eliminate downtime. Both models can be mounted curbside or street side, providing flexibility to tackle any job. The HIPPO P-Model is driven by the truck’s engine, enabling it to provide power with a small footprint. This single compact unit boasts the ability to operate several functions simultaneously. Because the unit has just one engine to maintain, downtime is reduced and efficiency is maximized. HIPPO E-Models are self-sufficient units that incorporate their own diesel engine. Adding an E-Model to a truck allows it to operate in states with even the most stringent engine idle laws. Trucks with an E-Model can be used for power in tunnels, mines and other confined areas. E-models are customizable with an array of power units for specific jobsites. The HIPPO Power Pack is a small unit, designed to provide power directly from the truck’s bed, while the Power Pack Plus incorporates hydraulic power in a compact design. In addition, HIPPO’s Power Plant is a complete mobile power resource that delivers four types of power from a single unit for severe duty applications. The HIPPO Hurricane takes output to another level by delivering 100 cubic feet per minute of air. The Multipower units have safety features that provide safe multipower use in extreme environments, including: emergency stop, center point pick-ups, lock out devices, warning lights, and full steel and aluminum enclosures.